The study of the existing burial sculptures from Cyprus reveals a continuous production of reliefs with human representations. With the exception of some isolated finds of anthropomorphic reliefs of the Middle Bronze Age period, as in the case of the low relief from a tomb at Karmi1, the continuous development of the grave reliefs on the island started at the end of the 7th century BC to the 3rd century AD. The characteristic figures and types, as well as the idiomorphic style of these reliefs, demand an independent approach, and not only in terms of the established Greek models. Most of the reliefs were found during amateur excavations in the 19th century, made by foreign consuls and bankers who, besides their formal duties, were also engaged in archaeological activities. Best-known amongst them is Luigi Palma di Cesnola, who served as the American Consul in Cyprus and excavated at various regions all over the island. The result of these activities was the lack of excavation reports and documentation regarding the location and positioning of the grave reliefs and the burial contexts, a fact that hampers the archaeological research related to the burial cult and to the precise dating of these stelae. Most of these grave reliefs were found at Golgoi, Amathous, Marion, and Salamis, while many of them are of unknown provenance. Today they are scattered, together with other Cypriote antiquities of the 19th century, at various museums mostly in Europe and the United States, such as the Metropolitan Museum of New York, the Louvre in Paris, the John and Mable Ringling Museum in Sarasota, Florida, and the Cyprus Museum in Nicosia. More recent finds were mainly produced during hazardous excavations and are kept in the museums of Cyprus. In spite of the relatively small number of grave reliefs that have been found, there is a wide variety of stelae forms and scenes with figures and symbols that demonstrate the merging of different influences from neighbouring cultures into the local traditions and perceptions. As already mentioned, most of the grave reliefs have been found extracted from their original context, a fact that considerably hampers the determination of their chronology. As a consequence, their chronological classification and evolution had to be achieved mainly through stylistic comparisons. In the Cypro-Archaic period, stelae with a cavetto capital crowned by two heraldic lions, sitting or reclining, predominate [Fig. 1]2. The crowning of the stelae with lion figures has a long tradition in Cyprus. Already since the late 7th century BC stelae with a cavetto capital. The lions are portrayed in profile and they occupy the whole of the horizontal upper surface of the architectural framework. They turn their heads towards the viewer, exposing their tongue and teeth in a threatening manner, crossing their front legs and coiling the tail around their hind leg. 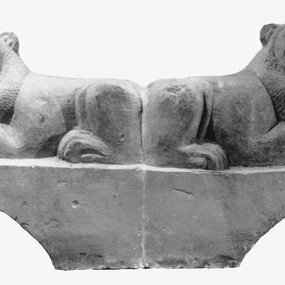 Comparable reclining lions are known from the Near East and Asia Minor, yet these are stylistically far from those found on the island.3 The stelae crowned with lions cease to exist after the 4th century BC. 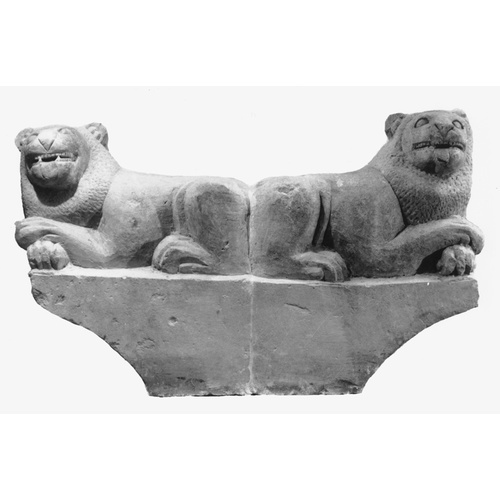 Sitting lions, on the other hand, are stylistically related to the lions found on Rhodes, Samos and in Cnidus, while numerous examples sculptured in-the-round have been found in various parts of Cyprus, such as at Trikomo and Kyra. The chronological evolution of the stelae crowned with lions is attested mostly through the shape and form of the lion’s mane, whereas other features remain almost unaltered. The earliest example dates to the late 7th/early 6th century BC. During the 6th century BC, stelae crowned with sphinxes4 appear sporadically. The position of the body of the sphinxes coincides with that of the previously mentioned lions of the 6th century BC. The stylistic treatment of the wings and the hair refer to identical in-the-round examples found at Kameiros on Rhodes. During the Cypro-Classical period, most grave reliefs follow in general the new stylistical tendencies of their contemporary sculpture. Hence they reflect the growing influence of the Greek art on the artistic production of Cyprus at a period when it was impossible to ignore the canon of the classical forms and style, in particular of the Attic grave reliefs of the 5th and 4th centuries BC. Despite the Greek influence however, the deeply-rooted archaic local traditions and perceptions continued and remained alive, especially at the interior of the island. 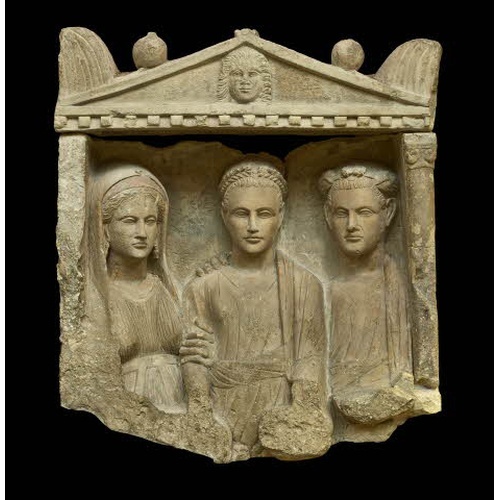 On the basis of archaeological research, classical grave reliefs are divided in three groups according to their style. The first category includes stelae based on the Cypro-Archaic traditions featuring sporadic east Greek influences, as is the case of reliefs with banquet scenes crowned with lions [Fig. 2], and reliefs with frontal human figures placed inside deep niches.6 The distribution of these stelae can be observed from the the central-eastern regions of the island as far the east coast, which certainly reflects a local workshop production at the area of Golgoi that was known as far as the city of Salamis. The second category includes stelae of Cypriote character that imitate Greek prototypes, in particular reliefs with figurative scenes that follow the themes of the Attic grave reliefs [Fig. 3], for example a woman with a slave, farewell or mourning scenes.7 Most of these stelae have been found in the northwest and south regions of the island. The third category includes stelae of Greek origin. These are excellent marble stelae imported to Cyprus most probably after their completion and have been found mainly at Marion and Kition. The Cypriote grave stelae of the Hellenistic period are hard to be dated with any certainty. The unclear picture of the stylistic development of the Cypriote sculpture, the absence of comparanda and the fragmentary state of many of the stelae cause additional difficulties to their chronological classification. The stelae of the Εarly Hellenistic period follow traditional Cypriote as well as Greek forms, such as niches with pediment that resemble funerary banquet scenes (Totenmahl) and also naiskoi and pseudo-naiskoi with a variety of themes [Fig. 4].8 During the 3rd and 2nd centuries BC, characteristic features of Ptolemaic portraits penetrate the Cypriote sculpture, due to the island’s incorporation in the Ptolemaic Kingdom in 310 BC. Figures on grave reliefs obtain portrait-like features and contemporary hairstyles, while less attention is paid to the execution of the body. The height of the stelae can reach 185 cm and all the main figures are worked in high relief. Only a fragmentary grave relief with a male head wearing a wreath can be dated to the end of the 2nd/beginning of the 1st century BC.9 However, in many cases the chronology is limited to the general designation “Hellenistic”, since the study of the Hellenistic sculpture cannot yet present accurate chronological criteria. Based on their shapes, grave stelae can be grouped into six main types, distributed in certain parts of the island. Type 1a includes stelae with cavetto capital crowned with heraldic lions [Fig. 1], and type 1b, rectangular stelae crowned with heraldic sphinxes. Type 2 includes a characteristic group of stelae with representations of funeral banquets placed in a niche. This type follows a chronological development that is subdivided as follows: a) stelae with a small rectangular niche crowned with lions placed on a narrow plain slab [Fig. 2], b) stelae with double niche and pediment, and c) stelae with one niche of large dimensions and pediment [Fig. 5]. Type 3 includes stelae with a simple rectangular niche, often crowned with palmettes. Type 4 involves frameless stelae decorated with palmettes [Fig. 3]; type 5 includes stelae with naiskos and pseudo-naiskos [Fig. 4]; finally, type 6, stelae with kioniskoi. The study of the origin and interpretation of the figures and motifs on grave reliefs of Cyprus reveals a variety of subjects, symbols and features that are defined by the tradition as well as by the adoption and alteration of foreign elements. Their presence is either of a symbolic character or serves the heroization of the deceased or corresponds to their function in daily life. Symbolism played an important role in the burial context of the Cypro-Archaic period. The frequently attested motifs of the crescent and the solar disc or the winged sun disc are examples of stellar symbolism. They offer a variety of interpretations and they usually relate to religious beliefs and burial customs. These motifs were adopted in Cyprus from the Phoenician religious cult and were incorporated into local burial customs. The interpretation of these motifs in Cypriote funerary cult, and consequently in the existing grave reliefs, relates to the circle of life, death, and the afterlife. Lions and sphinxes depicted as grave guards [Fig. 1]. The Cypriote use of lions in burial contexts was probably inspired by the East, yet the use of sphinxes was already known on the island from Greek grave stelae. The depiction of these figures suggests a steady development from the beginning of the second quarter of the 5th century BC down to the Roman period. The focal point is the depiction of the deceased imself placed often in scenes of heroization [Fig. 2], farewell scenes often attributed through the characteristic gesture of dexiosis [Fig. 4], as well as family scenes in which gestures reveal the affinity of the represented figures with the decised [Fig. 5]. Cypriote subjects and figure representation are closely related to the corresponding Greek ones, yet some diffrences and alterations can be detected, as in the case of the strictly frontal posture or the depiction of family bonds among the figures that reflect local perceptions and habits. Based on current data research, the motif is attested in burial contexts for the first time only in the 5th century BC. The funerary banquet scene is sporadically depicted on grave stelae from Asia Minor, with superimposed fields.14 In these examples, the reclining man is interpreted according to the eastern perception, as a nobleman in a banquet, in order to stress the high social status of the deceased. In parallel to stelae from Asia Minor, these scenes are also attested in burial contexts in Cyprus, from the beginning of the 5th century BC.15 Funerary banquet scene was a popular theme in Cypriote burial art, as is implied by the frequency of its depiction. The scenes depicted on grave reliefs developed their own distinct character, as they preserved a combination of eastern and Greek perceptions. The symposiast is depicted with a rich wreath, well-combed hair and beard, often holding a pouch (valantion) and a cup in his hand, accompanied by his wife, child, or servant, or is depicted in a family scene. Compared to other figures, the reclining man is represented disproportionally large so that his high position in the family and in the society in general can be stressed. Women are usually placed in the middle of the couch or separately on a stool. However, the depiction of the reclining woman in the 4th and 3rd century BC is unique. In Greece, similar scenes are not attested prior to the Roman period. Farewell scenes that resemble the known Attic motif of a seated and a standing figure shaking hands (dexiosis) are also part of the figurative scenes [Fig. 4]. In this frame, the deceased is usually depicted seated, while the wife/husband, a servant, some relative, or a child is standing in front of them. 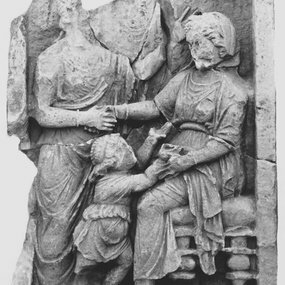 Another depiction is that of a mother known in Cyprus as kourotrophos, that was adopted in grave reliefs and was incorporated into a family scene with the presence of children. Among the depictions of individual figures, there are those with features suggesting the age, the profession or the occupation of the figures, as in the case of young Aristila with a small bird in her hand [Fig. 3], and warrior Dionysios in an armour.16 Last but not least, the bust of a figure in relief, placed in a niche, is depicted on some inscribed burial kioniskoi. Stylistically, iconographically and typologically, grave reliefs display common features according to their provenance and finding spot. 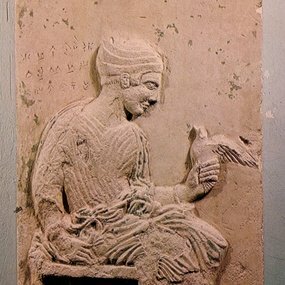 The considerable production of sculpture in the Mesaoria Plain, where there is an abundance of available limestone, explains the dense distribution of grave reliefs especially in the central-eastern parts of Cyprus. In spite of the strong influence of workshops of other cultural landscapes, local production at the workshops of Golgoi preserved its own distinct character to a high level of quality. The constelation, iconography and style of most of the Archaic and Classical stelae from Golgoi and the surrounding area are based on Cypriote traditions with occasional Phoenician and east Greek influences. The systematic production of grave reliefs at the sculpture workshops of the northwest and south regions began in the Classical period, with the exception of some archaic samples from Amathous, and was dominated by the imitation of Greek models. The Cypriote grave reliefs made of limestone coexisted with imported, high-quality marble stelae of Greek origin that mark the strong commercial links with the Greek world. The production of grave reliefs that was based on traditional Cypriote perceptions continued during the Hellenistic and the Roman periods in the central-east regions and along the east coast. East Greek influences became more obvious but they also adopted elements of the Ptolemaic and Roman imperial portraiture. During the Hellenistic period, the stelae of the northwest and south regions meticulously follow Greek prototypes, while during the Roman period a tendency of a conventional and provincial implementation on stelae can be observed. Due to insufficient evidence, many questions regarding the placement of the stelae in the burial grounds still remain unanswered. The lack of information regarding the necropoleis, along with the inaccurate information about their origin and position in the burial ground, limit the research considerably. Technical observations, sporadic information from written sources and comparisons with other cultural landscapes suggest that the reliefs were placed either in the walls of the dromos of the rock-cut chamber tomb, or right over the grave or tumulus, on a plinth or base. 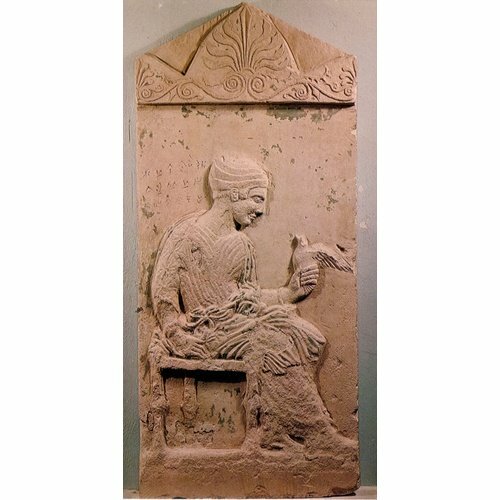 The majority of Cypriote grave reliefs were made of a local, soft, fine limestone. As already mentioned, soft limestone was found in abundance in the central and east parts of Cyprus, since it is the main rock formation in the Mesaoria Plain. Consequently, the production of Cypriote sculpture was mostly located in these areas. Grave stelae made of porous limestone, in which small fossil-shells were found, are limited. Porous limestone was rarely used due to the deterrent properties of the material that hamper the curving of the surface. At the same time, due to the commercial links with the Aegean islands and mainland Greece, ready-made marble stelae reached the coastal regions of the island, and were available to be used. A large number of grave reliefs preserve traces of paint, mostly red, and also green and yellow (that were probably blue and white originally). These traces suggest that the whole representation was initially decorated. Paint was used to denote the space where the scene was taking place, for example the entrance or the decorated walls of a house, as well as all the details, such as patterns and motifs on garments and objects, and also hair and facial features. The study of grave reliefs is based on the surviving number of stelae that are kept in various museums in and outside Cyprus. This number of stelae is of course relatively small; however, it sheds light on many questions related to burial art and practices as well as to the social background of the island, especially from the 6th century BC to the 3rd century AD. Moreover, through the grave reliefs, acculturation processes and the assimilation of foreign cultural elements by local traditions are attested, as a result of the relations between the island and neighbouring peoples. Because of its geographic position, Cyprus was in close cultural and social relations with the East (Syria, Phoenicia, Egypt), and the Greek world over the centuries. Throughout its history, Cypriote art assimilated the influences of the surrounding cultures, incorporated them into local traditions, and thus shaped its own distinct identity. However, until recently the idiomatic character of Cyprus had received only minor attention from archaeological research. On the contrary, the influences of various foreign cultures that prevailed at times were viewed as individual stylistic phases of Cypriote art. Noticeably, acculturation processes in the East Mediterranean, with Cyprus being a “meeting point” of cultures, were disregarded. This acculturation process shaped an independent artistic style, which we could call, using the phrase of Aeschylus, Cypriote Character. Fig. 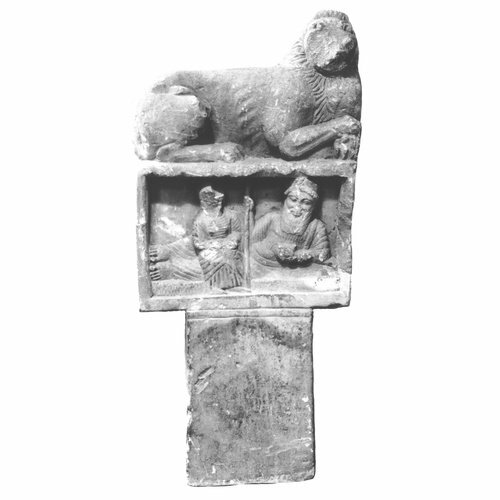 1: Grave stele with heraldic lions from Idalion (Second half of 6th century BC – beginning of 5th century BC). Cyprus Museum, Nicosia, 1941/X-6/Ia. © Department of Antiquities (photograph: Department of Antiquities). Fig. 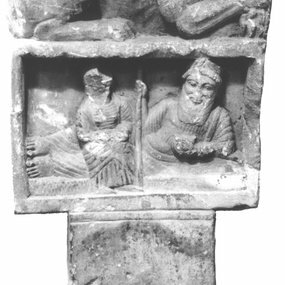 2: Grave relief with funerary banquet scene, unknown provenance (Second quarter of the 5th century BC). Cyprus Museum, Nicosia, C235. © Department of Antiquities (photograph: Department of Antiquities). Fig. 3: Grave relief of Aristila from Marion (Circa 420 BC). Local Museum of Marion-Arsinoe, Polis Chrysochous, MMA 276. © Department of Antiquities (photograph: Department of Antiquities). Fig. 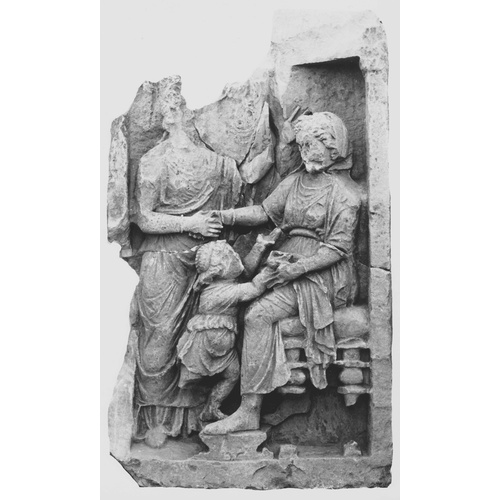 4: Grave relief of a seated woman (Late 4th - early 3rd century BC). Regional Museum of Paphos, PM 2023. © Department of Antiquities (photograph: Department of Antiquities). Fig. 5: Grave relief with three figures from Tremetousia (near Golgoi) (1st century AD). British Museum, London C431. © The Trustees of the British Museum, London (photograph: British Museum) link: http://www.britishmuseum.org/research/collection_online/collection_object_details.aspx?objectId=464240&partId=1&images=true. 1 Cyprus Museum, Nicosia, 1961/V-10/1 – Merrillees 1994, 37-41, pl. 12b. 5 E.g. Pogiatzi 2003a, 31. 6 E.g. Pogiatzi 2003a, 12-19 and 32-36. 7 E.g. Pogiatzi 2003a, 41, 43, 57 no. 102. 8 E.g. Pogiatzi 2003a, 19 no. 31, pl. 21 no. 33, pl. 48 no. 84. 9 Pogiatzi 2003a, 66 no. 118. 10 E. g. Pogiatzi 2003a, 26, 39 no. 67, 55. 97. 11 Drawings of the different types of stelae: Pogiatzi 2003a, 31, 34, 37. 12 For example the relief from the palace of Assurbanipal at Nineveh at the British Museum in London: Fehr 1971, 7-9, pl. 1. Symposium: Dentzer 1982, Matthäus 1999/2000, 46 ff. 13 Matthäus 1999/2000, 47-49, 51, 55. Poyiadji-Richter 2007, 212-215. 14 Stelae from Daskyleion, at the Archaeological Museum of Istanbul: Fabricius 1999, 34, fig. 6, 35, fig. 7. 15 Sarcophagus of Golgoi, Metropolitan Museum of New York: Karageorghis et. al. 2000, 204-206 no 331. 16 Grave relief of Aristila from Marion: Pogiatzi 2003a, pl. 41 no. 70. Grave relief of Dionysios Kardianos, from Lysi: Pogiatzi 2003a, pl. 43 no. 73. Brehme, S., Brönner, M., Karageorghis, V., Platz-Horster, G., Weisser, B. 2001: Ancient Cypriote Art in Berlin, Antikensammlung, Museum für Vor- und Frühgeschichte, Münzkabinett, Nicosia. Brown, A. C., Calting, H. W. 1975: Ancient Cyprus, Ashmolean Museum, Oxford. Budde, L., Nicholls, R. 1964: Catalogue of Greek and Roman Sculptures in the Fitzwilliam Museum, Cambridge. Cassimatis, H. 1973: “Les rites funeraires a Chypre”, RDAC, 116-166. Caubet, A. 1977: “Stèles funéraires de Chypre au musée du Louvre”, RDAC, 170-177. Cesnola, L. P. di 1885: A Descriptive Atlas of the Cesnola Collection of Cypriote Antiquities in the Metropolitan Museum of Art, New York I.
Dentzer , J. M. 1982: Le motif du banquet couché dans le proche-orient et le monde grec du VII au VI siècle avant J.-C., Rom. Ergüleç, H. 1972: Corpus of Cypriote Antiquities 4, Large-sized Cypriot Sculpture in the Archaeological Museum of Istanbul, SIMA 20,4. Fabricius, J. 1999: Die hellenistischen Totenmahlreliefs, München. Fehr, B., 1971: Orientalische und griechische Gelage, Bonn. Given, M. J. M. 1991: Symbols, Power and the Construction of Identity in the City-Kingdoms of Ancient Cyprus c. 750-312 B.C. (Unpublished Ph.D. Dissertation, University Cambridge). Gjerstad, E. 1948: The Cypro-Geometric, Cypro-Archaic and Cypro-Classical Periods, Swedish Cyprus Expedition 4,2, Stockholm. Hermary, A. 1989: Musée du Louvre, Catalogue des antiquités de Chypre, Sculptures, Paris. Karageorghis, V. 1998: “A Phoenician Type Funerary Cippus from Cyprus”, CCEC 27, 123-126. Karageorghis, V. 2000: “A Cypriote Banquet Scene”, BCH Suppl. 38, 251-257. Karageorghis, V. et al. 2000: Ancient Art from Cyprus, The Cesnola Collection in the Metropolitan Museum of Art, New York. Karageorghis, V. et al. 2002, Ancient Art from Cyprus in the Collection of George and Nefeli G. Pierides, Nicosia. Karageorghis, V. et al. 2003: The Cyprus Collections in the Medelhavsmuseet, Nicosia. Kershaw, N. (ed.) 1983: Ancient Art from Cyprus: The Ringling Collection, The John and Mable Ringling Museum of Art, Sarasota Florida. Kurtz, D. C., Boardman, J. 1971: Greek Burial Customs, London. Matthäus, H. 1999/2000: “Das griechische Symposium und der Orient”, in: Nürnberger Blätter zur Archäologie 16, 41-64. Megaw, A.H.S. 1979: “The Head and Feet Fragments and another Stele from Marion”, in: Studies presented in Memory of P. Dikaios, 139-154. Michaelidou-Nicolaou, Ι. 1998: “Deux cippes funéraires du musée de Nicosie, Chypre”, CCEC 27, 145-147. Merrillees, R. 1994: “A Stone Anthropomorphic Bas Relief from Middle Bronze Age Cyprus”, in: F. Vandenabeele, R. Laffineur (eds), Cypriote Stone Sculpture, Proceedings of the Second International Conference of Cypriote Studies, Brussels – Liège, 17-19 May 1993 Brussels–Liège, 37-42. Myres, J. L. Ohnefalsch-Richter, M., 1899: Catalogue of the Cyprus Museum, Nicosia. Nicolaou, I. 1975: “Cypriot Inscribed Stones”, RDAC, 156f. Ohnefalsch-Richter, Μ. 1893: Kypros. Die Bibel und Homer, Berlin. Pogiatzi, E. 2003a: Die Grabreliefs auf Zypern, von der archaischen bis zur römischen Zeit, Peleus 23, Mannheim. Pogiatzi, Ε. 2003b: “Das Gelage auf kyprischen Grabreliefs”, in: V. Karageorghis, S. Rogge (eds), Junge zyprische Archäologie, Münster, 73-88. Poyiadji-Richter, E. 2007: “Τα κυπριακά νεκρόδειπνα: Το επιτύμβιο ανάγλυφο της συλλογής του Παγκυπρίου Γυμνασίου”, RDAC, 211–224. Poyiadji-Richter, E. 2009: “Roman portraits on Cypriot grave reliefs”, in: A.M. Guimier-Sorbets, D. Michaelides (eds), Actes du Colloque “Chypre à l’époque hellénistique et impériale”, Recherches récentes et nouvelles découvertes, Nanterre – Paris 25–26 Septembre 2009 (CCEC 39), 177–196. Poyiadji-Richter, E. 2012: “Funerary portraiture on hellenistic grave reliefs from Cyprus”, in: P. Scherrer, G. Koiner, A. Ulbrich (eds), Hellenistic Cyprus, Proceedings of the International Conference, Department of Archaeology, University of Graz, 14 October 2010 (Keryx 2), Graz, 77–90. Poyiadji-Richter, Ε. 2014: “Aspects of Funerary Art, The Sculptures in the Cyprus Collection in Berlin”, in: V. Karageorghis, E. Poyiadji-Richter, S. Rogge (eds), Cypriote Antiquities in Berlin, in the Focus of New Research, Münster, 169-191. Pryce, F. N. 1931: Catalogue of the Sculptures of the Department of Greek and Roman Antiquities of the British Museum, London1 I 2. Raptou, E. 1997: “Note sur les coutumes funeraires de Marion a l’époque classique”, RDAC, 225-237. Tatton-Brown, V. 1986: “Gravestones of the Archaic and Classical Periods: Local Production and Foreign Influences”, in: V. Karageorghis (ed. ), Cyprus between the Orient and the Occident, ACTS of the International Symposium, Nicosia, 439-453. Vessberg, O., Westholm, A. 1956: The Hellenistic and Roman Periods in Cyprus, Swedish Cyprus Expedition 4,3, Stockholm. Wilson, V. 1969: “A Grave Relief from Marion”, RDAC, 56-63. Yon, M. 1973: “Les lions archaïques”, in: G. Arnoud (ed. ), Anthologie Salaminienne, Salamine de Chypre 4, Paris, 19-45.